...FOR BEAUTIFUL ONE OF A KIND JEWELRY PIECES! Un-stained brass stamping and finished earring. I have had many requests for a tutorial about staining metal for jewelry projects. 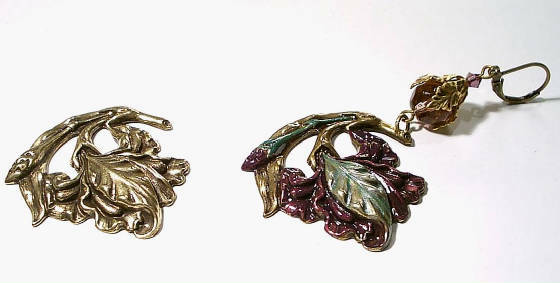 There are many ways to paint, enamel, and antique metal. I will be discussing glass stain here. The glass stain that I use is the same that is used to stain glass for windows and other stained glass projects. COLOR MAGIC, by the Eastman Corp. is the best and most economical product I have found. Start by purchasing primary colors so you can mix your own unique colors if you wish. I would suggest the additional colors, Opaque Black and Opaque White as well. 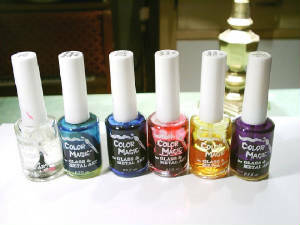 You will need thinner; ordinary lacquer thinner works great, and the Anti-oxident Top coat. This is important for a more finished look to your piece as well as protection against the colors fading. Remember that this is a solvent-based product so you need to work in a well ventilated area. Also, try to keep your bottles closed tightly as the stain will thicken over time if exposed to air. A few drops of thinner will solve this problem. 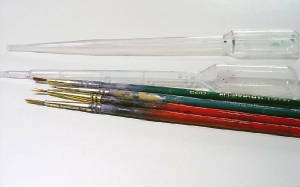 For intricate work, air-brushes are available. I prefer very thin natural hair brushes. They are easier to keep clean and are far less expensive to purchase! Do buy the best natural hair brushes that you can afford. They can easily be cleaned between colors and do not clog like air-brushes. For very fine work, eye-liner brushes work great! Almost any kind of metal can be stained with this product from silver to brass. Be sure that you metal is clean before beginning. Soapy dishwater works great. Rinse and dry thoroughly. I have had some success staining over plated items. It really depends on the item. Try using a lacquer-thinner soaked Q-Tip over the entire area you wish to stain before beginning. 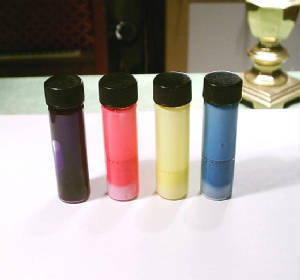 I purchased a set of small glass perfume sample bottles and a couple of pipettes for mixing colors. They work great! As far as technique goes, you will need to develope your own. Remember that darker metal will produce a darker color under transparent stains. The same goes for brighter metal. I would suggest using a medium grey under-coat to alleviate this problem. For example, using a dark-blue transparent stain over bright yellow brass may give you teal! If this is not the color you were looking for, a primer coat will be necessary. Don't be afraid to experiment! You can erase "mistakes" with lacquer thinner and begin again! Don't load your brush when applying color. These are stains and they may run into an area you do not wish to color. If you need to apply a second coat, you really do need to wait 24 hours before doing so, otherwise you will end up with blotchy areas. Some colors can be baked in a warm oven for faster drying. Transparent Black is NOT one of those! It will turn cherry-red! I allow the finished piece to cure for 24 hours and then I apply the finishing top-coat. The stains will not flake off and, if cured properly, do not wear off! It's advisable to wear a magnifying visor in a well lighted area for intricate work. Any questions you may have can be directed to me! Good luck and happy creating!